Credit for this idea goes to the artist lapin, who shared it on a Q and Art video about warming up which you can check out here. He recommends warming up by quickly scribbling blind contour drawings of people. Less than a minute or so on each, and you do it without looking at the paper. Of course, what results is often a mess in terms of looking like the person! It can be hard to place the mouth in relation to the nose when you can't look at the paper. 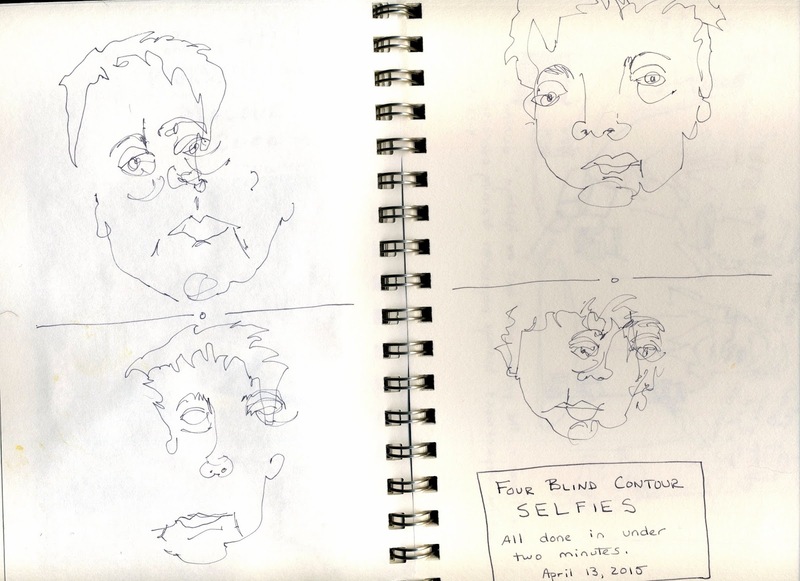 But blind contour drawings help train your eyes to see and your hand to follow. The process is good for your skills at paying attention. Plus, sometimes the resulting wonky drawings have a vibrancy and charm all their own. None of them looks like me. They all look like me. Super fun. Super quick. An interesting way to look at yourself and others. I can't wait to give it a try out in a public place later this week. I also think this will be fun to try with other members of the family. Imagine how closely--and sweetly--you will have to look at each other to draw each other in this way. What wonderful things, other than the drawings, might result?